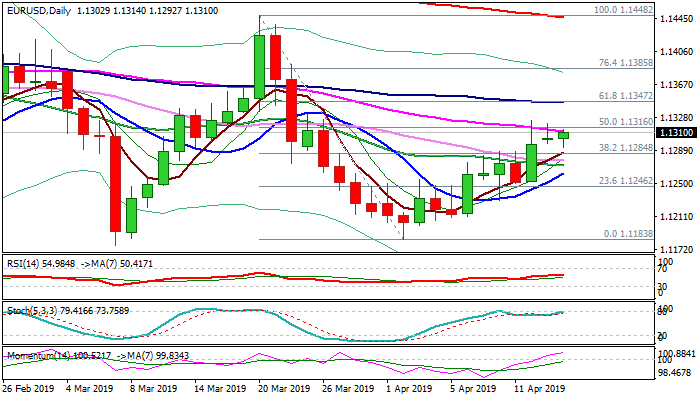 The Euro remains bid and probes again through daily cloud base (currently at 1.1308) following repeated failure to penetrate cloud in past two days, with action being capped by falling 55SMA. Rising bullish momentum supports the action but may conflict with overbought stochastic on daily chart. Sustained break above pivots at 1.1312/16 (55SMA/50% of 1.1448/1.1183) would generate fresh bullish signal for recovery extension towards 1.1347 (Fibo 61.8%) and possible acceleration towards 1.1372 (daily cloud top). Broken 30SMA (1.1277) needs to hold and maintain bullish bias.